7. Save your wealth against future calamity. Do not say, "What fear has a rich man, of calamity?" When riches begin to forsake one even the accumulated stock dwindles away. 9. Do not stay for a single day where there are not these five persons: a wealthy man, a brahmin well versed in Vedic lore, a king, a river and a physician. 10. Wise men should never go into a country where there are no means of earning one's livelihood, where the people have no dread of anybody, have no sense of shame, no intelligence, or a charitable disposition. 12. He is a true friend who does not forsake us in time of need, misfortune, famine, or war, in a king's court, or at the crematorium (smasana). 13. He who gives up what is imperishable for that which is perishable, loses that which is imperishable; and doubtlessly loses that which is perishable also. 16. Even from poison extract nectar, wash and take back gold if it has fallen in filth, receive the highest knowledge (Krsna consciousness) from a low born person; so also a girl possessing virtuous qualities (stri-ratna) even if she were born in a disreputable family. To read the translation of all the chapters of Chanakya Neeti In Hindi you can navigate to the f0llowing link which has the compilation of all the chapters in Hindi. Chanakya Neeti Hindi-First chapter. 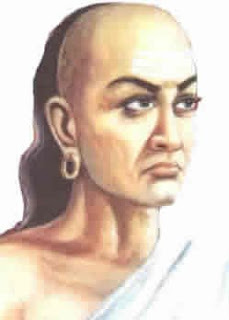 Hindi translation of first chapter of Chanakya Neeti.Hindi and English translation of chanakya niti hindi.